This has been a hard week. In the midst of organizing Gary's medical records and browsing my notes from the "go-zillion" Dr. appts., lab reports and tests, some old feelings have been dredged up. Again, I find myself tempted to despair. It shouldn't come as a surprise, that these temptations sneak in when least expected. You'd think, that since I've been so encouraged by the small, but measurable improvements in Gary's speech and balance recently, I'd be well defended against sadness but I must still guard against the Enemy's attacks on my joy. Beginning in 2006, and for several years following, we were on a constant roller-coaster ride of emotions as we got devastating news, and experienced the steady falling-away of Gary's mind. On top of that were the secondary trials of finances, insurance changes, moving, changes in lifestyle, etc. There were many, many tears shed over those years. Lately, most days, it has not been so bad, emotionally. Acceptance has a lot to do with that. This is who we are. We have Alzheimer's Disease in our marriage. Proactively looking for blessings helps too. Gary is not unhappy. I actually think he is content as he lives "in the moment" and I enjoy my family, and my friends, and my painting. I enjoy being with Gary. 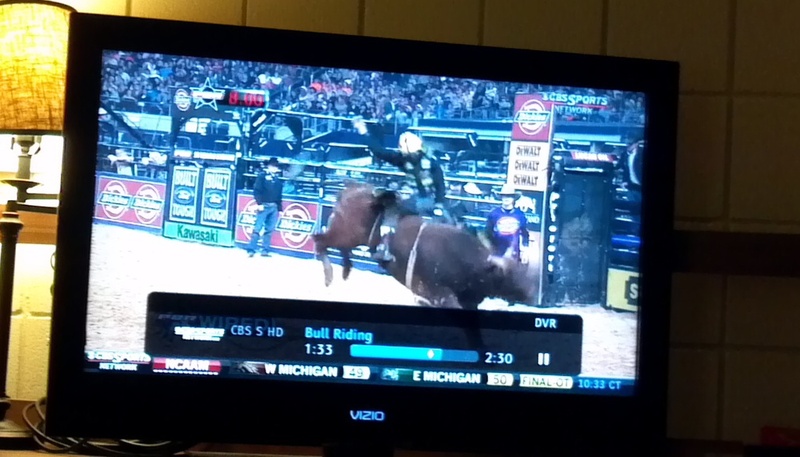 We sit together on the sofa and watching Bull Riding, until he falls asleep. I read the Bible to him sometimes, during the morning when he is alert. Today I picked his apple up off the floor for him and he spoke to me. "Thank you," he said. 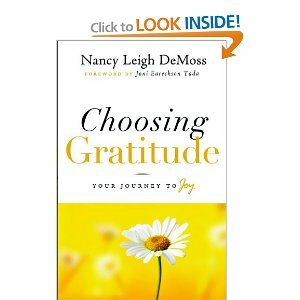 Choosing Gratitude by Nancy Leigh DeMoss is a wonderfully helpful book. It has become one of my favorites. You can buy it HERE on Amazon.com.